Sounds like a great book! Kind of brings back the values we had growing up. Every Monday at school, we all share our highs and lows from the weekend. It's a great exercise! This sounds like a really great book! Last year I spent a good amount of time with my husband working on a family mission statement. It was really interesting to get it down on paper. I'm sure that as my kids get older we will try and revisit the mission statement, but as of now it really fits all of us. Those do sound like excellent suggestions, with good sense behind them! This book sounds wonderful. Wouldn't this be a wonderful wedding or baby shower gift. I plan to stock a couple of copies so I will have them for this purpose. I always trust your book reviews! This sounds like such an amazing book. Just recently we started eating meals as a family. It was always me and the boys but my husband started making great efforts to leave work to come join us. It has made a world of difference. This is a well-written review, and it sounds like a good book, too. We always had dinner together as a family growing up, and I still like to have dinner together with Larry, even though there's just the two of us! I think it's a good time to really listen to each other and talk about things in an unhurried manner. This really sounds like a wonderful book. Sounds like a good book. Thanks for the review. I like the idea of sharing family history at meal times. When my children were in elementary and junior high school it was easy to set a time for dinner as they entered high school and had sports,jobs and volunteer work it was not so easy. A friend recently said that she sees so little "intentional parenting" these days. The world would be such a better place if all parents took seriously the raising of their children. I admire your devotion to your family. I really like the idea of asking about the high and low points of the day. Never thought about that! I'll have to do that more often. So much more interaction needed between family now days...looks a good book. I do love the idea of a family dinner, but am almost embarassed to admit we are lucky if we all get to eat together twice a week!! I should try and do the family lunch! I think it sounds like a terrific book. Help is always a good thing! I'm glad you found some valuable tips that you can use within your own family. Best of luck in implementing more as your children grow! I think you could write your own book! 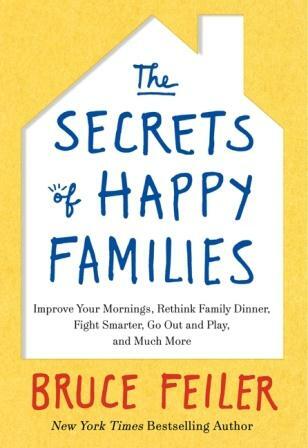 "I think one of the ways to keep your family happy is just to be consistently thoughtful and intentful in how your family is operating." Well said! Eating together is important in our family too. My husband and I have always eaten together, but we really started including our son around 9 or 10 months, which was around the time he started eating more solids. Dinner is such a fun time for us but I've never thought about some of the things I could bring up to discuss during this time. I love your ideas and the ideas you got from the book. I'll be putting those to use in my own home! This sounds like a good one too!